Throughout the store you’ll find an ever-growing selection of quality-made and carefully sourced items like cooking utensils, coffee mugs, stainless steel bottles and insulated mugs, teapots, coffee pots, canning jars, fermenting crocks, locally-produced note cards, calendars, magazines and books. 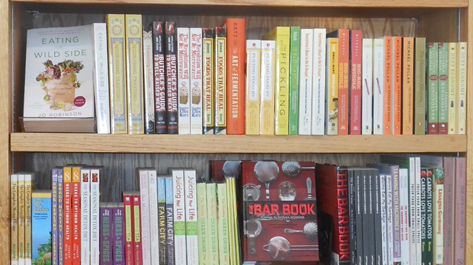 Our book selection centers on the topics of food, health, and community. We carry a limited number of titles by local and regional authors. For other great paper items, we offer a spinning rack loaded up with one-of-a-kind greeting cards from local artists like Pioneer House and Sara B. Weber. Next to our registers you’ll find over 50 different magazine titles on topics ranging from energy efficiency to economics, fashion to food, and poetry to permaculture. Our cooking utensils run from those for everyday use, like peelers, wooden spoons, and cutting boards, to crocks and canning equipment. We offer a variety of sizes of Ohio Stoneware fermentation crocks, crock lids, and mixing bowls, products produced in Zanesville, Ohio. Our canning selection is wide, from Ball jars ranging from pints to a gallon and a variety of Weck canning jars, which come in beautiful and unique shapes and sizes. Three Rivers Market also carries BPA-free lids. We also stock reusable bags for your produce and groceries in a variety of fabrics, sizes, colors and styles from comfortable canvas to recycled Chico bags to our classic blue nylon bags made through One Bag at a Time. We now offer Produce & Grain Bags too, which further cut down on plastic bag use. Our tea and coffeepot selection has grown tremendously in the last year. We carry filter-drip Chemex and Assam coffeepots in small and large sizes, along with Assam’s Bodum teapot with a stainless steel filter. We also sell tea strainers and tea balls. Choose any of our Klean Kanteens to wet your whistle. 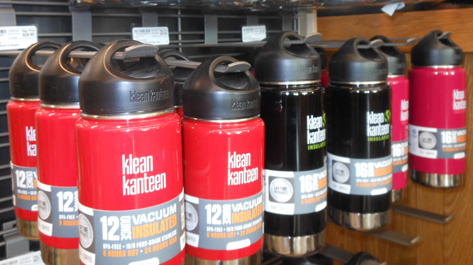 We offer Klean Kanteen Stainless Steel Bottles in 12 oz, 16 oz, and 20 oz sizes. These come insulated or non-insulated, with a sports-top or without and we have Klean Kanteen food canisters in two sizes and insulated or non-insulated variety! 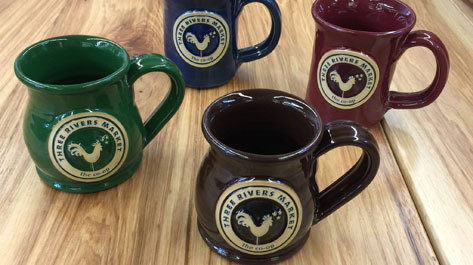 Three Rivers Market offers an assortment of co-op merchandise, including coffee mugs, pint glasses, shopping bags, and insulated thermoses with our logo. Support your co-op and spread the word with any of these products!